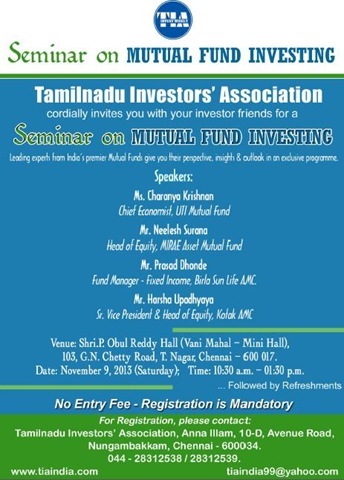 Do attend the program being conducted by TIA (TamilNadu Investors Association) this Saturday 9/Nov/2013 at Chennai. The speakers are Fund Managers of UTI Mutual Fund, MIRAE Asset Mutual Fund, Birla Sun Life Mutual Fund and Kotak Mutual Fund. ← Why is Sensex at all Time High?